If you own rental property and you are dealing with difficult tenants, you are not alone. Even though you did your due diligence and screened them thoroughly, sometimes what seemed like ideal tenants at first can turn into your worst nightmare. If you find yourself in this unfortunate situation, this article covers 4 ways to deal with a difficult tenant in Los Angeles, CA. If you are a landlord, it’s not a matter of if but when you will have to deal with a difficult tenant. Sooner or later you’ll have that one tenant that you are sorry you every rented to and who is making your life miserable. You know what I’m talking about. The tenant that is always late on their rent, or they call you with every little thing that comes up. Maybe they’re trashing your property or have too many people living there or making excessive noise and you are getting complaints from the neighbors. Many times, renters like these know that California Rental Laws are in their favor and they know how to milk these laws and even threaten you to the point where you are afraid to take action. No matter what kind of tenants you are dealing with, here are 4 ways to deal with a frustrating tenant in Los Angeles when it happens it to you. Staying objective means treating your rental property like a business and staying emotionally detached as much as possible. I know this is not easy at times, especially when dealing with a difficult tenant. Don’t get sucked into their personal drama and situations. This may be especially difficult if you are renting to friends or family members, who are most likely expecting special treatment. You don’t have to be like a rigid robot, but definitely keep a professional distance. Don’t get too friendly with your tenants. Set your rules and policies clearly in your lease and enforce them fairly but firmly. And if they are engaging in bad behavior that is really getting under your skin, keep your emotions in check and deal with them professionally. Emotional outbursts only further deteriorate the relationship. Don’t take it personally. Keep the lines of communication open with your tenants. Ignoring the problem in hopes that it will go away is the worst thing you can do. Try to reason with them and discuss the bad behavior and possible ways to resolve the situation. Explain to them that you are running a business and how their behavior is impacting your business. Maybe some of the original terms of your Agreement can be re-negotiated. See if you can find some resolution. If you’ve tried to resolve the situation but with no success, then you may have to evict your tenants. Evicting a tenant can be very expensive, costing thousands of dollars. The eviction process can also be very stressful, so you definitely want to do everything you can to make this option your last resort. If you must go this route, then start the process immediately and don’t waste time. Evicting tenants can be tricky and you should be familiar with California Eviction law. Follow the eviction process exactly and whatever you do, don’t use tactics like changing the locks, turning off the utilities or threatening the tenants. Tenants have rights as well and California tenant laws often favor tenants over landlords. 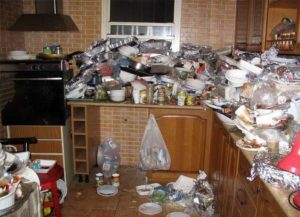 It might be challenging but in the long run, it will be worth it to get them out and get a good tenant into your property. Another option is to offer them money to leave. This is called “Cash for Keys.” You agree on a certain amount for them to relocate. You will have to pay money out of your pocket up front, but it might be cheaper than going through the eviction process and a lot easier. If your tenants are really giving you a hard time and you are fed up with the hassles of being a landlord, then you can always sell your property. In fact, many properties that we buy are from landlords that are tired of dealing with tenants. Depending on who you sell to, you may not even need to evict your tenants (for example, we often buy and evict them for you). Owners with family members as tenants really appreciate this because they find it difficult or even feel guilty when family is involved. If you want to sell your rental property to us and finally rid yourself of the hassles and headaches, then contact us so we can make you an offer. Click here now to fill out the form or call us at (818) 392-4845. Posted in Rental Property and tagged bad tenants, eviction, how to deal with a difficult tenant.